For today’s tennis lighting T5 fluorescent lamps have become the new standard for metal halide replacement. Not only for most commercial applications but especially indoor sports and tennis facilities that have demanding lighting requirements for safety and competitive play-ability The most common reason to switch from metal halide to T5 is because of their energy efficiency (typically 40%-60% less energy), however they also out perform metal halides on many levels. Over the last 12 years I have been designing and providing indoor T5 tennis lighting and still today with every new installation of T5 tennis court lighting the dramatic improvement of light quality combined with efficiency is almost magical, the improved tennis court lighting quality is by far the most appreciated feature to tennis players. 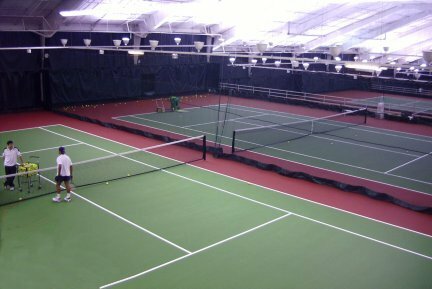 (Pictured above) is a indoor tennis facility that had existing 19 metal halide lighting fixtures per court (all Courts left in picture) consuming over 20,000+ watts per court , whereas the court on the left had our T5 fluorescent high output lighting using only 8,420 watts per court. Which court would you prefer to play on? 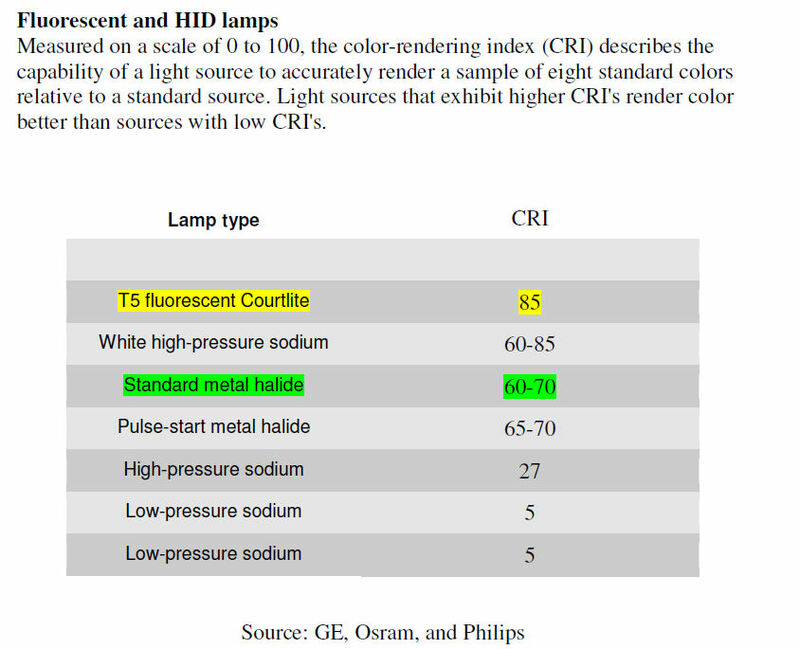 The major lighting quality factor is primarily the Color rendering Index (CRI) properties of the lamps. Metal halide are typically 60-70 CRI and the T5 fluorescent was 85 CRI (cri chart), as you can see the halides on the courts to the right are dull a bland where as the T5 fluorescent court (left) is sharp, bright, and true to color. This alone has a huge impact on the tennis players experience. Another significant improvement from halide to T5 fluorescent tennis lighting is visibility of the ball. Most metal halide lamps actually flicker 120 times per second. When looking at static objects the flicker is not obvious. However, the next time you are watching a match in a facility that uses metal halides, watch the ball very carefully. When the speeds exceed 70-mph, what you will notice is that the ball disappears for very short time. This is especially evident as the ball leaves the racket at maximum velocity. The ball will not be visible for the first several feet. This is the strobe effect. Whereas the T5 lamps do not strobe, this will give the player more time to react, because they can see the ball at all times. Additionally this will help players also see the spin on the ball as the strobing from the halides prevent this. 1000-watt metal halide lamps have a rated lamp life of only 10,000-12,000 hours, and due to their rapid and significant lumen/light depreciation the light output will diminish by 40%-60% over the lamps life. T5 fluorescent lamps have a 35,000-60,000 hour rating, 3-5 times that of the metal halide, and only a 5-7% light depreciation over the life of the lamp. This means that your maintenance costs will be reduced dramatically and you will have far less wear and tear to the court surface due to equipment required to access the tennis lighting fixtures. Metal halide lamps have very limited manageability, due to the long warm-up time, most halides take 10-15 minutes to achieve full light output. Brite Court indoor tennis court T-5 tennis lighting offers total management, with instant on switching, with capabilities for multiple light levels from a single court. Often times when courts are vacant the metal halides are kept “ON” because of the long start-up time, with the T5 fluorescent instant “ON”, vacant courts can be dimmed or turned off until needed. This also makes it possible to have several light levels available depending on the events on the court, for example the Brite Court Tournament Direct system has 3 levels that can be instantly switched to tournament levels, recreational levels, or vacancy levels, when managed effectively adds a whole new layer of energy savings. Personally I cannot think of a single advantage of using metal halides for indoor tennis lighting especially with new high output fluorescent lamps that have become mainstream. I am often asked about the new buzz-word in lighting LED, the truth is LED lighting also has some great features like the T5 however it simply at this time does not have the ability to provide the quantity and quality of lighting required for a safe and enjoyable tennis playing experience. Now with T5 lamps available with a rated 60,000 hour life that equals or exceeds the lamp life of the LED which is typically rated at 50,000 hours. Check back soon for my blog post regarding LED tennis lighting.